At the end of Amours 2 (Marie) Ronsard places a cluster of chansons and other lyrics. Time to have a look at them! A luy qui ne s’en chaut. Ny les larmes à l’œil. Incontinent j’appris que c’est service. To make me fall in love! He who cares nothing for it. Nor with tears in my eyes. The master of my pleasure. A slave beneath your law. Who had begged me, instead now I beg you. 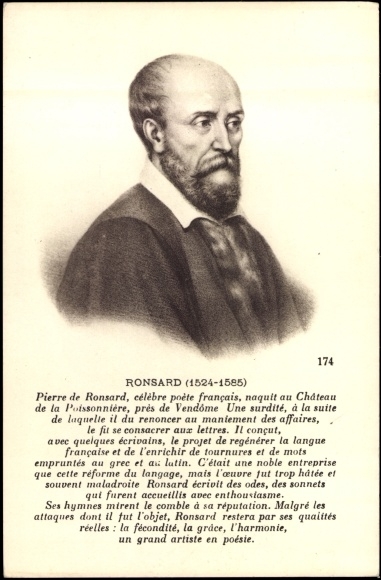 As with so many of Ronsard’s lyrics, the fluency and apparent inevitability of his lines is amazing. It seems so easy, so natural – and yet it makes perfect poetry, it rhymes and scans as if by chance. Wonderful. Just a few words about “l’oursal Aquilon” in the middle of the poem: ‘oursal’ indicates ‘of the bear’ here indicating the Pole Star in the constellation of the Little Bear – which points north, where Aquilo, the north wind, blows from. (Blanchemain puts the following stanza in [brackets] without explanation – this usually means it disappeared quite early on from the published editions. Ronsard divides it into 3 ‘pauses’ or parts; and there are two alternative openings (the later 1587 one printed by Blanchemain in a footnote). For simplicity I’ve shown the two at the beginning of the poem. I’ve also added a number of ‘footnotes’, indicated in the text to make it easier to locate them. Qu’en moi vivant il ne dure. Une autre douleur plus forte. Des premiers ans de ma vie. De tenter l’amour des hommes. Que le laict sur la jonchée. Jouer Lede sur la rive. Et peint de diverse sorte. Le soleil des eaux marines. De l’anse en semblable sorte. Jusqu’au fond de ce grand ventre. D’un lis au bas de la prée. Qui sein et menton leur souille. Pour la fin de ses peintures. Femme en lieu d’une pucelle. Du Grec marry pour les armes. Des cieux encor tu regardes. Et le blanc yvoire baise. Tout mignard près d’elle noue. Du cygne un lict de fleurettes. Such that it will not last in me while alive. From my heart of her portrait. Any other grief more strong. From the earliest years of my life. To try a human love. Like the captured spoils of war. Than milk on scattered rushes. Could be seen and admired. Together with enamel of many colours. This lovely piece of work resembled. He pulled his new oarage. Was accustomed to play on the bank. Right to the bottom of its great belly. Of a lily, at the bottom of the meadow. And soils their breasts and chins. The last of its pictures. A woman instead of a maid. Still watch over from the heavens. The flowers that are so many here. So sudden was her flight. And kissed her white ivory. It swam, all daintily, near her. It tamed the fair maid. The swan little flowers of light. He forced her, unwilling, to the ground. She felt her youth stolen away. “Where are you from, you flying deceiver? Of another sort, to my destruction. Has been stripped of its rose! Upon the hard flanks of the earth. Of these feathers which are not mine. Future ornaments of the world. 1 i.e. its new skin after shedding the old2 the description of what is painted on the basket, which fills the remainder of the poem, is a gentle parody of the descriptions of heroes’ shields in Homer and Virgil. Those unfamiliar with the myth – which was a major source of inspiration to Renaissance artists – should glance at Wikipedia, or this indicative set of images! The reference in the last stanza is to Helen of Troy. Aimant l’objet d’une figure vaine. O nouveauté d’une cruelle peine ! O fier destin ! ô malice des Cieux ! Cuide en faillant son mal estre son mieux ? Comme une cire aux raiz de la chaleur ? De son beau sang naistre une belle fleur. Loving the substance of an empty image. O the novelty of this cruel pain! O proud destiny! O malevolence of heaven! Should believe wrongly that its own harm is what’s best for it? Like wax in the rays of the [sun’s] heat? Created from his fair blood a beautiful flower. ‘Cephisides’ (line 12) is a classical form, ‘son of Cephisus’ – we’ve met Alcides, son of Alceus, elsewhere as a name for Hercules. The river-god Cephisus was father of Narcissus. Enamourés d’une figure vaine ! Comme une cire aux raiz de la chaleur ! Enamoured of an empty image! Sans me saouler je pren ma nourriture. Qu’au seul regard d’une vaine peinture. Un vray Narcisse en misere je suis. Hé qu’Amour est une cruelle chose ! Tant j’ay sa peste en mes veines enclose. I eat without being satisfied. Except only by looking at an empty picture. A true Narcissus in my wretchedness I am. Ah, how cruel a thing is Love! So much of its poison is locked up in my veins. The reference to Narcissus is, in contrast with the learned references of the last poem, nice and straightforward – as Narcissus gazed at his own reflection, so Ronsard gazes at his lady’s portrait – and no doubt there is a hint that he is in some sense reflected in her… Those who have aview on the Academy’s attempts to keep the French language pure will also have a view on Ronsard’s invention of the word ‘to un-hunger’! Me reschauffe, en pensant quelle fut sa clarté. Et sans jamais tomber se tient à mon costé. Au moins il regardoit je ne sçay quoy de beau. Et la beauté que j’aime, est terre consumee. Il mourut pour une ombre et moy pour un tombeau. Warms me, in thinking of the brightness that was hers. And stays, without ever falling, at my side. At least he was looking at something fair. But the beauty that I love is now absorbed into the earth. He died for a shadow, I for a tomb. Le Passant, et le Genie. Comme elle feit d’Ajax, du creux de ce tombeau. Et seiche ne peut rien produire de nouveau. Une fleur du sepulchre enfanteroit au jour. Elle enflame la terre et la tombe d’amour. From the hollow of this tomb as it did from Ajax’s. And, dried out, can produce nothing new. Would give birth to a flower from the tomb. She burns the earth and the tomb with love. Blanchemain makes only one tiny change – in line 10, he alers the article so it reads “soudain d‘humide cendre…”. That makes the translation of lines 10-11 something like ‘ …suddenly from the moist ashes / Of the tomb would be born a flower’. We all know that Narcissus thought himself the most beautiful thing on earth; there are plenty of nymphs called Clytie, but the one we want is probably the daughter of Pandareus (she is also known as Merope), to whom Juno gave wisdom and beauty. The flower of Ajax – thought by some to be larkspur – grew from his blood following his suicide, a flower marked ‘Ai’ (the first letters of his name, and also a Greek exclamation ‘ah!’, ‘woe’, ‘oh!’. This is the final sonnet of book 2, although there are some further ‘stanzas for Helen’ following it – – which are therefore technically the last Helen poem! Je consacre à ton nom ceste belle Fontaine. Et soit dite à jamais la Fontaine d’Heleine. Mille chansons d’Helene, et de moy luy souvienne. Aussi chaude qu’au coeur je sens chaude la mienne. I consecrate to your name this lovely fountain. And may it be named forever the fountain of Helen. As hot, as I feel my own flame hot in my heart. The master who “had so bad a fate” is either Narcissus (Blanchemain’s preference) or Hyacinth.